"Comfort" cushion is the lowest priced alternating pressure cushion overlay available anywhere! This product has 13 years of experience in designing and building behind it and is one of the best seating systems available anywhere in the world. 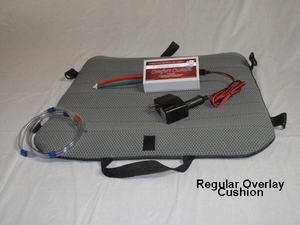 The "Comfort" Cushion is a much better version of our popular Trucker's Cushion, while designed originally for use by long haul truck drivers, was found by many people to be just the right thing to improve their comfort and circulation virtually anywhere they might sit and plug into on automotive cigarette lighter socket for power. The "Comfort" cushion is an ideal product for someone who may have limited mobility and spends most of their time in a lift chair or lounger. So many people were using their "Trucker's" cushions for 24 hour comfort that we completely redesigned the pump unit to be more user friendly and last longer in service. Attractive molded plastic pump case with rubber bumper feet to avoid scratching any surface. Advanced sound proofing for quiet running, measured at 32 dbs at 6 feet. LED Lights on both the power plug and the pump indicate when power is going into the pump unit. A warning LED on the pump unit will come on and "blink" a trouble code if unit malfunctions. These new electronics are made in the USA in our own facility. Size: 20" wide at front tapering to 18" at rear, 18" front to back. Thickness is 3/4 inch and overlay to placed on top of another cushion that provides the padding while the Comfort overlay provides the active massage that is the key to comfort and improved circulation while sitting. The cushion contains two air bladders. Each bladder has six tubular projections that look like fingers. The bladders extend across the whole cushion from side to side and interlace like the fingers of two hands. The right hand bladder connects to the pump on the right side of the cushion and the left hand bladder on the left. Both bladders support both the right and left sides of the sitter. A programmed microprocessor directs the pump to move air in and out of the bladders. They swell and deflate in a four step cycle. Both bladders are connected and at equal pressure. You are now sitting on air with equal pressure everywhere for four minutes. The right hand bladder swells up. Half your bottom is now sitting on top of six air filled tubes. The pattern of pressure would look like six horizontal stripes across your seat. The area of support is about fifty percent of the seat surface but to think of it as a half is misleading. The left hand bladder deflates and here is when the good things happen. The remainder of your bottom is now under no pressure at all. Blood flows freely into its tissues for four minutes. Both bladders are connected again at EQUAL pressure. You are again sitting on air for four minutes. The left hand bladder swells up and the right hand bladder deflates. The part of your bottom that was under pressure in STEP 2, is now under no pressure at all. Blood flows freely into it's tissues for another four minutes. The cycle repeats again from STEP 1. Six years experience with medical customers, often old and in poor health, has shown that this cycle is frequent enough to prevent pain and pressure sores. Note: A Comfort overlay should not be used over an air inflated cushion or gel filled cushion. This type of cushion will soak up the active massage movement so you won't receive the benefit of movement. Comfort cushion Overlay has a 6 month factory warranty on parts and labor. If the product fails to operate properly, we will repair or replace it at our option when it is returned to our facility. Shipping charges are the responsibility of the customer.